For the thousands of people who go blind every year from damage to the cornea (though trauma, disease, or missing limbal stem cells), a new cure may be in sight. The established treatment — a corneal transplant — requires finding suitable donors and doesn’t work for some patients. 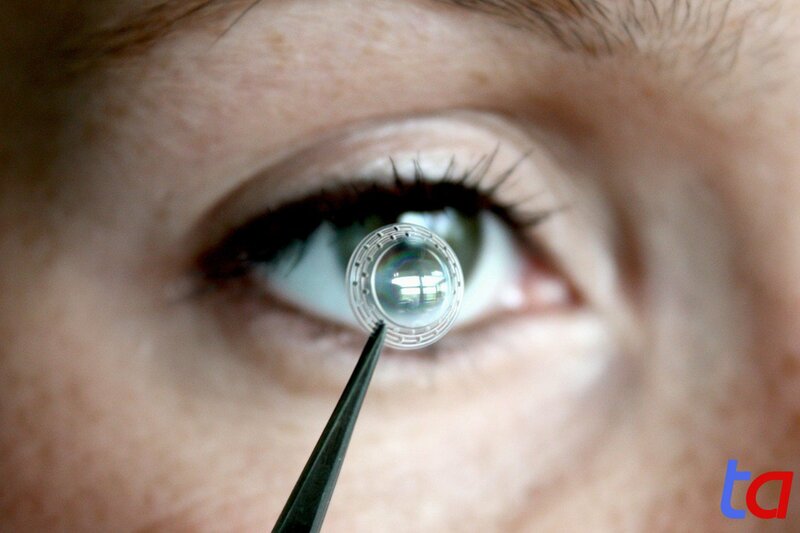 Now, German researchers are working to develop an artificial, implantable cornea. The ART CORNEA project team, led by scientists at the Fraunhofer Institute for Applied Polymer Research, has developed two types of artificial corneas. ArtCornea is for patients whose bodies reject transplanted corneas. The cornea is based on a water-absorbent polymer with a new surface coating and chemically altered haptic edge that promotes the growth of local cells that graft to the surrounding tissue, anchoring the implant into the patient’s eye. The researchers enlarged the device’s optical surface area, improving light penetration. The team says ArtCornea is hardly visible and does not trigger an immune response. ACTO-TexKpro is for patients who are awaiting a transplant. The team developed a chemically and biologically inert base material by coating polyvinylidene diflouride synthetic tissue with a reactive molecule. This allows the patient’s cornea to bond with the edge of the implant, yet keeps the implant’s silicon optics free of cells. The team says ACTO-TexKpro is suitable as a preliminary treatment for people whose corneas have been destroyed by chronic inflammation or a serious accident or burns. The team has successfully tested the artificial corneas in rabbits, and human clinical trials are commencing at the Eye Clinic Cologne-Merheim. The team is optimistic — several patients whose bodies had rejected human transplants received an early version of the artificial cornea in 2009 and are still wearing their implants today without complications. With an artificial retina (and retinal implant), cornea, and lens already being tested, the fully bionic eye might be closer than we all imagined.